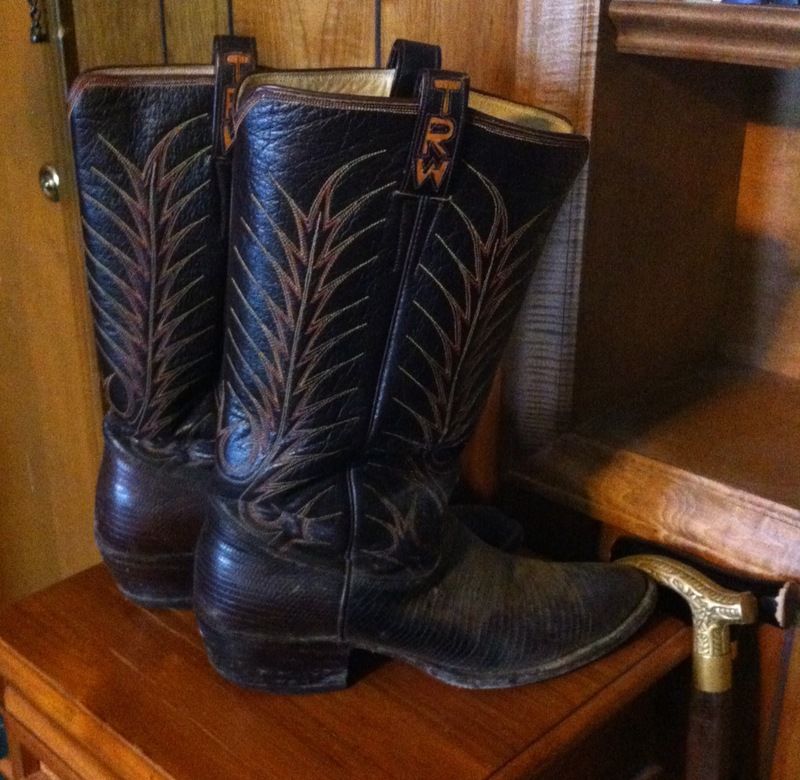 My husband, Tom, has a pair of genuine cowboy boots. His former cowboy boss and dear friend, Rex Dunlap, personally measured his foot in his office about 40 years ago. Yes, they are custom made. Tom’s initials are embroidered on the sides and at least one reptile lost its life in the making of these very cherished boots. I’ve witnessed the wearing of these boots. Once. We were with Rex and JoAn, walking a trail (more like a gravel road) in the mountains of Arizona 32 years ago. That’s the first and last time I’ve seen my husband put these boots on. That night, I had to peel them off his feet with as much strength as I could muster, thinking, if I ever get these off his feet, I hope he never tries to put them on again. I’ve been trying to pitch these boots for over 20 years now. I hate clutter. I hate hoarding things I know will never be used again. Things just don’t carry much weight for me. But they do for Tom. He loves to look at stuff from his past, and remember. They bring him back. He has a cowbell from his cheerleading days; bottles of stuff that remind him of his sales manager days, medals from his army days, pictures of his dance band, pictures of him dancing, awards from his time at Family Preservation, a bowling trophy, Indian Guide vests, and all sorts of soapbox derby memorabilia. That’s my husband. Yes he’s quite the collector. A collector of things that mean the world to him and only him. I think one of the things that keeps him going at 81 is the fear of what will happen to all these things when he departs this earth and enters eternity. I walk past most of these things every day and just see clutter. But not yesterday. Even though I don’t identify, I think I’m starting to get it. And here’s what I got today. My very dear and precious husband is still going. And not just going, he’s finishing well. Even though some part of his aging body hurts every hour of every day – he hasn’t given up.